As a roofing company in Miami, we install and repair all kinds of roofs. 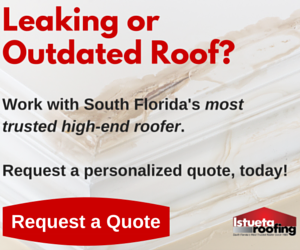 We’re well versed in every type of roofing that serves you, the Miami homeowner. We provide a diverse array of roofing services simply because we want to be able to help you with your roofing system, no matter what your situation is. From commercial properties with flat roofs, to luxury homes, to single family homes– we rigorously pursue continuing education to make sure we can complete any job. And it’s not a job well done unless you’re happy. When it comes to your roofing system, you need to be happy with the look, the durability, the cost, and the type of materials we use. For many of the homeowners we work with, tile roofs and metal roofs are the most popular. Metal roofing, in particular, is popular because of its overall lifespan, attractiveness, and its lower impact on the environment. In this blog post, we’ll take a look at each kind of roof we provide, in hopes that it will help you make the best possible decision when it comes to your own roofing system. We gladly work with homeowners who prefer an asphalt roofing system for their home. Asphalt shingles are the most common roofing type in the country, and there are many good points to having an asphalt roof. Cost Effective – Asphalt roofing materials are less expensive than other roofing types. They’re also manufactured and purchased in bulk, which adds to their cost effectiveness. Asphalt shingles are also easy to install, which can sometimes reduce labor costs. Weight – Asphalt shingles are lighter than slate and tile roofs, which is ideal for some homes. Versatile – Asphalt shingles are available in a variety of colors and types. In almost any case, you can find an asphalt shingle that perfectly matches your home. Asphalt shingles are not as durable as either tile or metal roofing, but they can have up to a 30 year lifespan if they’re properly maintained. They also weigh more than many metal roofing systems, so they won’t work as well for some home types. They’re often not as environmentally friendly as tile or metal roofs, either. Tile roofs are attractive, durable, and environmentally safe. They also fit in well with a variety of Miami’s architectural styles, which makes them popular among luxury homeowners. Design – Both concrete and clay tiles come in a huge variety of colors and styles. They can look like wood or slate, or they can come in an ornate, barrel style that will draw the eye of any passersby. Durability – Tile roofs can withstand harsh weather conditions without flinching. Some tile roofs installed centuries ago are still functioning to this day. They’re also fire resistant. Value – Houses with tile roofs are often appraised at higher values than homes with asphalt roofs. In general, the also have more curb appeal and sell more quickly. Green – The manufacturing process for most tile roofs doesn’t include any chemicals that harm the environment. They generally meet Energy Star requirements, and allow for good air flow– which lowers energy costs. Easy Maintenance – Tile roofs are durable, but they’re also easy to maintain and repair. Tile roofs are heavier than most other materials, so you’ll need to take that into consideration when you’re making a roofing decision. Tile roofs are versatile, durable, attractive, and long-lasting. They’re a great choice for a variety of Miami homes. For homeowners, luxury homeowners, and business owners alike, metal roofing is a great choice for Miami’s architectural aesthetic and climate. Many homeowners don’t know that metal roofing comes in an astounding variety of styles and colors, and it can match any home or neighborhood. It’s also durable and lightweight. Wind, water, and fire resistance – The interlocking panels on a metal roofing system mean your roof is less prone to wind damage and leaks. Because it’s metal, it’s also highly fire resistant. Variety and Appearance – There’s a high-quality metal roof to suit any kind of building, be it home or business. Metal comes in so many colors and styles that you might be surprised just how sophisticated and elegant a metal roof can look. If you have a home, we have a metal roof that will match it perfectly. Eco-Friendly – Metal roofing is often made from recycled material, and it can be recycled once it’s no longer in use. It also keeps homes cooler in the summer and warmer in the winter, which saves on energy costs. Compared to asphalt shingles, its carbon footprint is minimal. Durable – A properly-maintained metal roof can last longer than 50 years and still look brand new. Low Weight – The lightweight nature of metal roofing means transportation costs are lower, and most any home can support a metal roof. A lower roof weight can also extend a building’s total lifespan. Metal roofs are popular in Miami because they’re sustainable, they’re long lasting, and they’re attractive. It’s the total package. As a roofing company in Miami, we’re well trained in the installation, repair, and maintenance of all roofing types. We find that tile roofs, and especially metal roofs, are popular with Miami homeowners. Tile and metal roofs are a great investment, and add real value to any home. No matter which kind of roof you need, we have you covered.